Posted by StrategicGrowth in Mobile Marketing, Social Media, Strategic Growth Concepts, Video Marketing, Virtual Technology. This is an updated re-print our our resolution article from 2010. We had a lot of requests to update the article and re-distribute it. We hope you find it of value. I had someone ask me today about their business, “If I could do one thing better, what would it be?”. As a business consultant, I am frequently asked some version of this question, but today it got me thinking that the close of one year and the start of another is probably a great time to pass along one of the answers to that question that I give to everyone who asks it of me. Are you ready? Here it comes! Resolve for 2012 to fully embrace technology and to completely integrate it thoughout every aspect of your business; from your marketing, to how you work with and interact with clients and staff, to how you manage your administrative tasks and operate your business, etc. What I mean by this is: integrate and take advantage of all the benefits that today’s technologies have to offer, including: webinars and other types of virtual events (including virtual environment events), social media, mobile technology (and I don’t just mean mobile marketing), cloud computing software options, video, email and any other type of technology that will help you increase efficiency, productivity, and profitability. Those that don’t choose to embrace technology will be left behind very quickly because 2012, I believe, will be a ‘game-changing’ year for how business is being conducted. Mobile technology in particular is having significant impact on the way we live and the way we conduct business today. If you continue to do business as you always have, you – and your business – will very quickly become irrelevant. could mobile technology enable your customers to order and pay for your products or services via their cell phone? can you use social media to interact with your customers and potential customers on a more in-depth level so you can be certain you’re providing the products and services they need? will location-based technologies enable you to more effectively target potential customers? 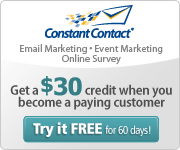 do you have an email marketing program to keep clients, vendors and staff aware of what’s going on in your business? If not, why not? can you make your field staff more productive by dispatching them with tools provided by GPS mobile technology? can you get more immediate response to special offers by sending them directly to your existing customers via their cell phones? can cloud-computing technology allow you to access information from wherever you are as long as you have some sort of mobile computing device (think smartphone or tablet anyone?)? can RFID mobile technologies help you manage your warehouse more efficiently? can you be more available to your staff for those decisions only you can make if you’ve embraced the use of a SmartPhone or tablet device? can you cut down on travel costs, and yet increase the number of people that you can effectively interact with to present your products or services by engaging in virtual sales and training programs? can bluetooth or QR code mobile technologies help your firm in the manufacturing or supply chain processes? can mobile marketing technologies make your marketing more effective? can you get more people to engage with your website or product videos by enabling them to reach it via QR code technology? would video technology help you more effectively communicate the benefits of your product or service? can mobile technology help you increase the viability of the leads you receive at the next trade show you participate in? can participating in virtual trade shows help you decrease travel costs for your staff, and the ‘down time’ that results from that travel, while increasing the number of viable leads you receive? could social media, mobile and virtual technology increase your ability to recruit new employees with higher rates of effectiveness? could the use of mobile technology increase lead generation at trade show events your firm participates in? So far, I’ve not found one business that I’ve spoken with or worked with that would not be positively impacted by increased integration of technology in their business. Given that, I now challenge you to consider how technology can help to improve your business – and as a result, your life. If you would like some assistance in evaluating your business and the options available to you, please contact us, Strategic Growth Concepts is here to help! Here’s to increased efficiency, productivity and profitability in 2012! The author, Linda Daichendt, is Founder, CEO and Managing Consultant for Strategic Growth Concepts, a marketing / management consulting firm focused on start-up, small and mid-sized businesses, as well as the Executive Director of the Mobile Technology Association of Michigan (MTAM), a trade association for Michigan’s mobile /w ireless industry. Linda is a recognized small business expert with 20+ years of experience in a wide variety of industries. Linda is available for consultation, and can be contacted at Linda@StrategicGrowthConcepts.com. The company website can be viewed at http://StrategicGrowthConcepts.com . MTAM’s website can be viewed at http://GoMobileMichigan.org .